Romana Diesel is the leading Iveco dealer in the world, as well as the largest private company in Rome. The CRM project also included a significant part of guidance counseling for defining the most suitable commercial policies for each type of customer ranging from the trader who buys a van every three to four years, to companies with hundreds of fleets of heavy vehicles. 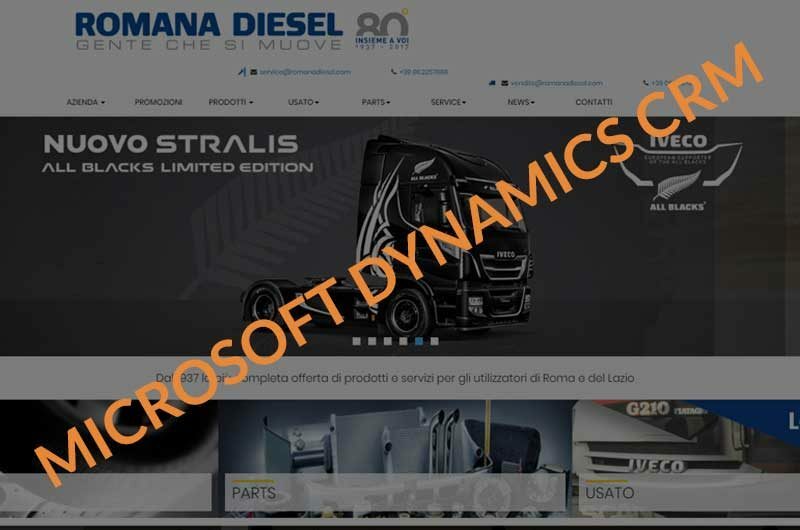 Thanks to a specially crafted methodology and the custom functions realized with Microsoft Dynamics CRM, each customer receives the right degree of attention and is visited according to his needs and potential. The project also included a substantial part of training for sales force, aimed at acquiring better time management capability to maximize sales yield. The Project is operational since 2012. We put the client at the hearth of every our action and we try to “educate” our clients at adopting the same approach. We are Marketing, Sales Management and Business Development experts so we know well the value of a satisfied client and how could be deleterious the loss of one. Losing a client has both direct effects on revenue, and indirect effects on the corporate image and it also undermines the possibility of finding clients with the “word of mouth”. All of this is nowadays even more exasperated by the disarming immediacy of the web. We take care of the clients in every step of the business relationship. We are available, reactive, pragmatic and sensitive and we have internal processes and computer tools that can go along with this orientation. This is much better than merely put the capital letter at the beginning of the word “client”. iWIZ deals with marketing and technology playing such practices as inseparable components of the right mix of knowledge transferred to its customers. Through the synergy between our two business lines, Innovative Solutions and Trading & Innovation, we cater to both the medium and large market companies by providing design services and implementation of networks and architectures, even complex, collaborative portals and solutions for management of information and processes, especially those unstructured, and SMEs to which work alongside us to help them improve their performance by recovering competitiveness through strategic planning, communication, the development of markets, including foreign markets, the management of the relationship with (CRM) technology, innovation, web, e-commerce. Among the clients we include both large international companies and both domestic small and medium enterprises of various sectors, from retail to industry through the services and advice. We aim to become the benchmark for corporate communications, corporate branding and digital marketing. We approach our projects with the understanding that, in order to maximize the objectives, it is essential to integrate and coordinate the web, digital and more traditional instruments at our disposal and use them in synergy within the framework of a strategy. A strategic use in particular of digital channels and social media is in fact the most effective way to create quality content, generating social engagement and, thus, create value for the enterprise.